The words “Home Renovation” need not strike fear in the hearts of the DIY illiterate. The truth is, it’s never been easier to redesign your living spaces- with professionals dedicated to making your vision a reality. Having a home in Northern Beaches is, of course, by itself a solid investment. However, older properties could see a dramatic increase in value just by making a few simple upgrades. 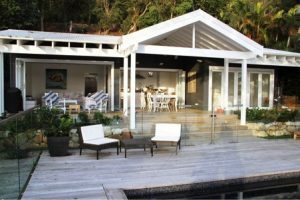 The subsequent headings detail two of the most important areas to focus on to perfect your Northern Beaches home renovation. See all of our building services that we offer. Without a doubt, the kitchen is the heart of any home. As well as being a central focal point, design decisions made here tend to set the tone for the rest of the house. A sleek, modern kitchen can really create the “wow” effect, often clinching the deal as far as prospective buyers are concerned. A sense of space is crucial here. No one likes to work in a cramped kitchen and certainly no one likes to look at one. Cupboard and bench space should be maximised. An island bench top can be helpful as well as immensely practical in this regard. Despite the emphasis on “making it new”, a seaside or rustic theme can easily be overlayed on an otherwise modern kitchen, creating a sense of regional character. As previously mentioned, creating a sense of space and flow is critical to modern interior design. Your outdoor living area is no exception to this rule. Coastal regions, like Northern Beaches, particularly should take full advantage of the local, refreshing sea breezes. Folding or sliding doors leading onto a deck or outdoor living area provide an excellent means of seamlessly integrating the exterior with the interior. Gorgeous views should be fully capitalised on where possible. Large windows, not only aid in showcasing this aspect, but also help balance the home with plenty of natural light. If you have any more home renovation questions, feel free to contact us. With over 20 years of experience in Northern Beaches Home Renovation, we’ll definitely have the answers you’re looking for. The seaside scenery and stunning bushland landscapes are some of Northern Beach’s most iconic characteristics. It should be no surprise then, that the art of landscaping for this region lies in integrating these natural elements into your own backyard as seamlessly as possible. 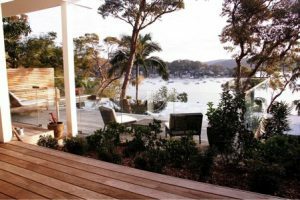 We have compiled a few great ways to take full advantage of your Landscaping Northern Beaches potential. Adding greenery provides a substantial boost, not only to the aesthetic of your outdoor area, but also to your property value. However, before you rush out and buy your pick of the nursery, there are many factors to consider. Native soil quality tends to be an issue in coastal areas, with high-salt or sandy ground not being uncommon. Wind-exposure can also present additional challenges. Fortunately, these problems are easily remedied. If you have an older yard with poor soil nutrition-value, it isn’t too difficult to restore the area with a dirt and compost mix. Trees and large bushes can help counter erosion. Choosing plants especially adapted to the seaside locale can significantly reduce upkeep issues in this regard. Additionally, they can help create a sense of theme and continuity with the surrounding natural environment. Judicious selection and placement of plant species is key to establishing form and flow. As a general rule of thumb, larger plants should go towards the back, acting as natural screening, with progressively smaller plants being used to stagger the midground and foreground. Plants of similar type should be grouped together for ease of maintenance as well as for visual appeal. Palm trees, of course, also can add that classic, seaside holiday feel. As well as being absolutely critical to the success of any outdoor entertaining area, raised decking is an excellent way to create a sense of flow between the house and the garden. In order to get that professional look, you’ll need to consider the type, colour and quality of the timber you plan to use. Will it be exposed to the rain and harsh summer heat? Often Northern Beaches homes are close to the sea or to bushland areas where insects and moisture might pose a challenge to the longevity of certain timbers. 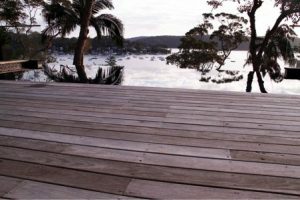 Of course, your personal preference when it comes to the appearance of the deck will factor in too. Landscaping Northern Beaches is one of our specialities, visit our services page to see what we offer. If you need any help or have any questions, feel free to contact us and have a chat with our friendly team. Choosing a Builder in Northern Beaches, Sydney: 3 Things to Consider. 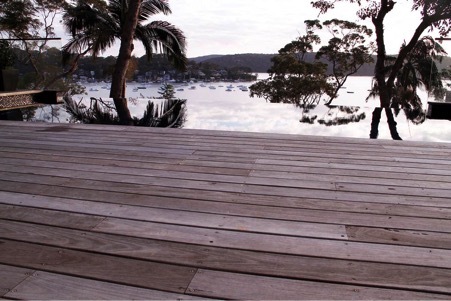 So, you’ve decided to take the plunge and build in Sydney’s best coastal locale. Considering Northern Beaches is one of the most in-demand areas in Sydney; featuring idyllic lifestyle, iconic seaside scenery and property value stability- even during times of regional downturn – it’s safe to say that you’ve embarked on a wise investment. Now, the only thing standing between you and your masterplan is the all-important choice of constructor. There are many factors unique to this area that should contribute to your decision. 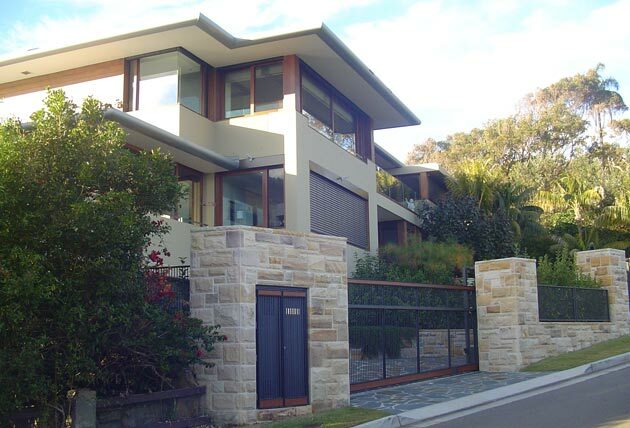 The following are the top 3 considerations to be made when choosing your Northern Beaches builder. 1. Are They a Custom Builder? 2. Clear Communication- Especially When It Comes to Budget! It’s essential that an open line of discussion is maintained at all times. Questions should be welcomed and answered with directness and consistency, particularly where money is concerned. Your builder’s pricing process should be completely transparent. If they seem to just be plucking numbers out of thin air- even if they’re cheap ones -be suspicious. You’re likely to accrue a host of unintended, hidden costs. Soil and contour tests: must be done before builder can even give you a quote! The concept of the 5th room is centered around maximising the space and land your property provides. Taking advantage of every opportunity to expand and utilise your living area is one of the keys to amplifying your property value. 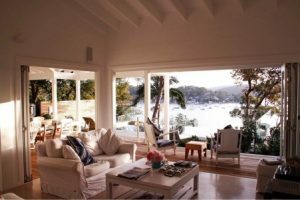 Spacious living that creates a flow from inside to outside is becoming more and more sort after and common in homes on the Northern Beaches. Taking full advantage of picturesque views and monitoring children’s playtime activities are enhanced by the effective design and creation of the 5th room. Setting up your seating appropriately for entertaining is key. Using the space without overcrowding it can be achieved by positioning tables and chairs in a way that works with the flow and design of your home. Your seating should also work with the positioning of your home and utilise the sun and shade; work with the elements, not against them. Incorporating bench seating into the retaining walls adjoining the landscaping around your area is a great way to maximise your space for entertaining. This is one example where you can create a large number of seating options without encroaching the walk through space and having floating chairs everywhere. Your landscaping needs to suit your environment and can really make or break the look and feel of your 5th room. 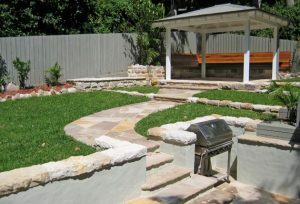 Whether you are going for a slick or rustic look will guide the landscaping choices you make. Palm trees are often a popular plant in outdoor living areas. 2 key ways to create flow from inside to outside is to incorporate bi-fold or sliding doors. You may need to remove some walls or change your space to allow for the installation of these types of doors but they are paramount into creating flow from inside to outside. Too many walls and doors is a quick way to destroy the feeling of flow form inside to outside. Plus, there’s nothing worse than having a huge journey from your inside kitchen to outside entertaining space. Having your kitchen close to your outdoor space gives you easy access to food and a preparation space. It also provides the benefit of being able to cook while also watching your children play outside, which for any young family is a huge benefit. 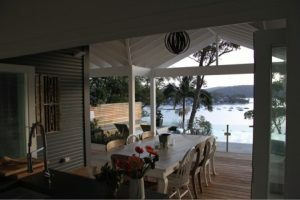 A decked courtyard area is very popular on the Northern Beaches. It creates a holiday feel and maximises views! Ensuring there is sufficient covering and shelter is essential for entertaining and using your 5th room in all weather conditions. Building your outdoor living space to be child friendly is vital for attracting home-buyers. This is a key feature young families will particularly be very aware of and becomes increasingly important for entertaining purposes where you may have children over. Building clear boundaries that incorporate fences and gates around pools, edges and drops is important to creating a child friendly space. This can be done all without compromising look, feel and flow of your space. Glass fencing is a good way to avoid impeding your view or altering the design and space of your home. Incorporating these keys aspects in your 5th room will help you create a space that the market on the Northern Beaches is looking for. Even if you aren’t looking to sell, you will be amazed at the opportunities a flowing indoor to outdoor space provides for entertainment and lifestyle. If you’re looking for other ways to improve or renovate your home, check out these 3 ways to add value to your home! Seen other ways people have really utilised their 5th room? Let us know in the comments! We’d love to hear you thoughts and ideas. Taking the cheapest quote for anybody with a tight budget makes sense and temporarily eases the pressure of cash flow. However with any cheap quote there is more than likely an accompanying catch. Unfortunately, that catch commonly doesn’t surface until the project is underway and is now complicated and expensive to correct. When analysing quotes, it’s important to not assume that the cheapest quote is the best quote for you. It may be more expensive now but often saves you long-term. We like to make sure that our Trentwood quotes have a clear and understandable breakdown of pricing and related work so that our clients are fully aware of how the quoted price equates to the quality of the final product. A common example of how the cheapest quote is not the best quote happens when a client receives two quotes from different builders for the same job with two different prices. Unfortunately, the common assumption is that the quotes are for the same quality and quantity of work, just one is quoted more expensive than the other. There is often some reading in-between the lines necessary in analysing a quote. The figure is not the only factor that a client should be considering when deciding which is the best quote for them. Often the cheapest quote is void of key elements that provide a quality project and final product. Often cheaper materials are used. The quality of work is often lower. There is a tendency to cut corners to save time. There can be extra overheads for insurance. Unforeseen expenses are charged along the way, not included as a contingency. Its important to understand that there will always be some aspects of the job that aren’t included in the drawing and mapping out of the project. A contingency should always be allowed for in a quote, as required by the Department of Fair Trading. It is important that sufficient time and evaluation of a quote is taken to ensure that assumptions are removed. This is to help you make a decision about a quote that will result in a high quality and cost effective project. If you’d like some more tips on avoiding common mistakes when undertaking your next project, check out our other post! Often the key to a successful final product is the planning and thought spent in preparation. The old saying “measure twice cut once” has real application when it comes to renovating. The more effective our preparation is, the smoother and more problem free the building process is. The Northern Beaches is infamous for its classic “beach shack” renovations and is a popular endeavor for many home owners as a great way to keep the character of your property whilst creating a home that caters to your needs. It is important for any owner looking to renovate to understand that an “Ad hoc” approach to renovating, whilst allows flexibility along the process, commonly ends up in breaking budgets and deadlines. Effective preparation will pay off in the end! So knowing how to prepare and what to prepare becomes an important question to answer before renovating. Here are 3 keys I would recommend in effectively preparing for your next renovation, extension or addition. Knowing your needs prior to commencing the building process is very important to effective preparation. It aids the design process as when you employ architectural and design advice they will have a clear parameters and outcomes to design in and from. It’s very important to sit down and think very thoroughly through what you need in the home you are building. Make a list of these needs, discuss with invested parties (i.e. spouse and children) and come to an informed decision around what you need. Knowing prior to starting the building process will provide a smoother building process and greater potential to come up with a design for your home that is specific to your needs. Planning within your budget is very important in order to avoid breaking it. As soon as you break your budget and start spending money you don’t have it is very easy to get yourself into trouble. You can end up with unfinished projects, disgruntled tradesman and unplanned debt if you fail to know your budget prior to commencing your renovation. It is important to note, things will always take longer and cost more than expected so when putting together your budget, it is wise to allow a buffer for these unforeseen but predictable occurrences. For example, “a lot of your budget gets buried!” This can be a shock to people because they were unaware of the cost and time it takes to build strong foundations. Good communication with your builder will provide you with a holistic understanding of what the building process for your renovation is going to require. A good strategy is to make a list of all your questions and sit down with your builder to go through this list of questions. It will provide the opportunity for you to get to know each other a bit more and for you to have your questions answered. When selecting your builder, its advisable to look for a builder who is willing and committed to work with your needs and not the other way around. This is something we at Trentwood pride ourselves in providing for our clients. If you take the time to know your needs, know your budget and know your builder you will be thoroughly prepared for your renovation and will experience a smoother and more effective building process. The truth hurts but we all need it! There is nothing worse than receiving a quote that sounds pretty and pleasing but is masking painful realities. Ignorance is bliss until it shows up on your bill! A builder will tend to want to tickle your ears, as anyone trying to sell something would, however as a client you need to know the realities of your building project. Often negatives are drawn from an honest quote, which can discourage builders to give an honest picture of what the project will take. You as the client can help your builder by having a realistic expectation of what it will cost and by getting into the nitty gritty of the project. Make sure you understand the quote and feel as though you have been given an honest valuation of what the job will cost. The cheapest quote isn’t the best quote because it is full of hidden costs and delays along the way making it more expensive than an honest quote in the first place. The more relevant information you can give your builder the better. Drawings from your architect, engineering details, council requirements and restrictions all greatly help your builder give you an accurate quote. The less prepared you are with relevant information the more likely the builder will not be able to give you a complete and realistic quote. In a lot of cases, the builder won’t give you a quote without the relevant information and DA approval. When calculating the time frame on a building project, the builder won’t be able to give you a realistic time frame until they have completed the quote and therefore shouldn’t. Remember, ABOUT isn’t a time frame and isn’t something worth hanging your hat on. Wait until you have an honest quote with the relevant information, then you can get a clearer picture of how long your project will take. Builders, if they feel under pressure to have a project done before Christmas for example, may make commitments that realistically they can’t keep but gets them the job. You can avoid this by being well prepared and allowing more than enough time to begin the process. Preparation and sufficient time allowed for the process should mostly help your builder give a truthful quote and timeframe on your project. Avoid builders who give untruthful or make unrealistic promises as it always costs more in the long run. Better to take longer and have a more expensive, honest quote initially than to run into trouble later on in the project. Renovating can be full of surprises and unexpected turns! 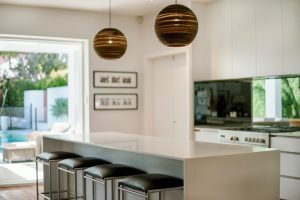 It can be extremely rewarding and beneficial for your property and home life, which makes it really helpful to know some key tips going in (especially if you’re new to renovating or undertaking your first renovation project). Trentwood has been involved in renovation projects for the last 30 years and over this time has mustered up a number of helpful tips that will be valuable for your first or next renovation. Spend the time in research, discussion, dreaming, comparison and brain storming what you want for your renovation! Don’t miss, rush or ignore this process; it becomes extremely important for creating a platform to build your project on. A half plan will never go to plan and is filled with changes and interruptions that draw out the project and drain your resources. Be sure to have all your requirements in place before you commence – kitchens, bedrooms, bathrooms, etc. Once you have as clear of a picture of what you want as possible, it is now time to get the drawings done. Bring in an architect and a builder to get a blueprint drawn up of what your renovation is going to look like. Again, this is an extremely helpful and vital process in preparing for your renovation and will save you time and money in the end! In other words, organise for the engineering details to be done; your builder will do this through his engineer. It more often than not will be beneficial to go through the existing relationship that your builder has. This is again another important process of preparation that will save lots of headaches later on. Plan a date that works for you and the builder and lock it in! The sooner you can get your project in the calendar, the more you’ll be fully prepared and ready for the commencement of your renovation. You can’t TALK TOO MUCH to your builder! Assumption is the mother of all stuff ups and communication is the antidote! Make sure you set up good, open lines of communication with your builder early on. This will significantly help in managing any problems or interruptions that may occur. Make sure you have funds to finish the project while you’re preparing for it. Don’t commence without having a solid financial breakdown and allowances for the completion of your project. Having to pause because of a shortage of money interrupts the flow and progress of your project and will inevitably affect the final outcome. Creating a list of names will help you know who’s who and what they are doing on your building site. This will help keep you in the loop and create a connected, “on the same page” environment for your renovation. Clear expectations of how long the project will take and what each step of development requires is very important. Come to an agreed time frame and schedule for your renovation with your builder so that you can manage any problems or interruptions. Make sure you have some clear boundaries and deadlines to keep your project on schedule and on budget. Every renovation project will be filled with unexpected hold ups and interruptions. There may be changes that need to be made and things that simply could not be foreseen in your preparation, so it’s important to remain flexible and open during the process. Having a good relationship, open communication and schedule with your builder as well as sufficient finances (that allow a contingency) will assist you in remaining flexible. These handy tips will provide some guidance and a template for you to work off on your next renovation, ensuring it is successful in process and outcome. Trentwood would be more than happy and capable to assist you with your project! 5 QUESTIONS: SHOULD YOU RENOVATE OR REBUILD? If you are asking the question as to whether you should renovate or rebuild the truth is, there is no definitive answer. There are advantages to both and therefore, finding the best direction for you to take comes down to which set of advantages best suits your needs and wants. Asking yourself whether you would prefer or can afford to rent somewhere during the re-build process or reside at your home under construction is an important question to answer. Renovating enables you to live in your home while the renovation is in progress. While this does mean you have to live in the middle of the mess, it does save the added cost of renting somewhere to live during the process. A rebuild would require you to find somewhere to rent during the building process, which enables you to live free from the mess of construction. However, it will be a more expensive venture. A renovation allows you to avoid undergoing any new property set backs that may upset your current boundaries. With a rebuild, there may be new setbacks required that can bring complications to your building projects. This however could be a positive thing if you are looking to make a change to your current setbacks. 3.) Same but new or new and different? A renovation enables you to keep the same characteristics of your house, for example, a Hamptons beach style house, while allowing you to freshen and update the look and feel of your home. Rebuilding does not give the opportunity to maintain the originality and authenticity of your home, but it does mean you get start with a blank canvas and have complete creative freedom in building your new home. With a new build it’s important to ask, are you knocking down and rebuilding something you’ve already got? Do you want to design the house you want or renovate the one you’ve got? With a renovation, you are always going to make old stuff fresh whereas with a rebuild, everything is new. For example, you may have to choose between new floors or a fresh polish of your existing floor. 5.) What will your funds allow? Do you have funds to renovate or rebuild? What level of debt are you able to afford and willing to commit to? A rebuild will have a clearer quote and most likely cost less in the future, where a renovation tends to have less clarity and potential to cost more as you go depending on the state of your property. I believe these 5 questions will help give you a greater sense of clarity so that you can make the best decision between either renovating or rebuilding your home. Renovating would tend to be the most popular option on the Northern Beaches at the moment, keeping the character and the originality of your home. At the end of the day, remember that your home is your castle and you need to be satisfied with the final product. For the blog this week, we thought it would be great to hear from one of our local clients in Avalon we recently did some work for. 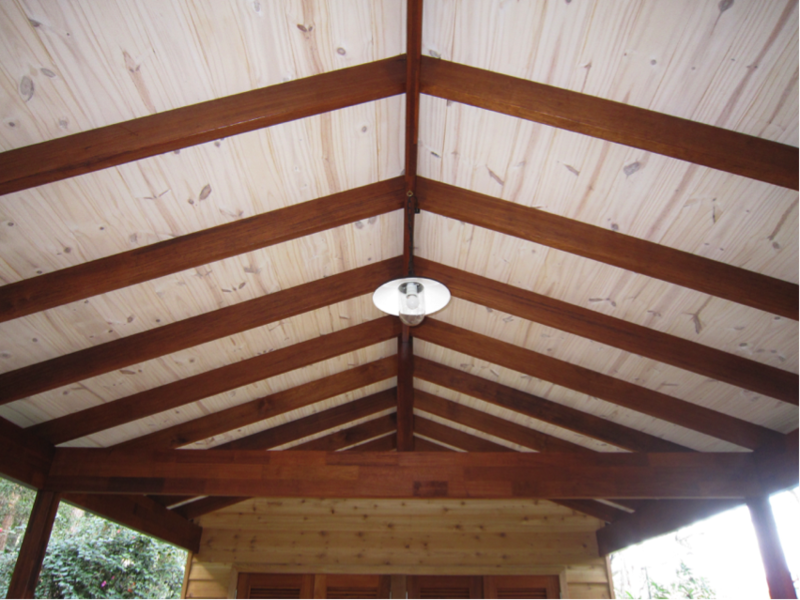 This job started off with a beautiful outdoor carport and expanded into much more! How many of us would like to do some changes to our home that don’t require a council DA or architect but are just too big to tackle yourself? 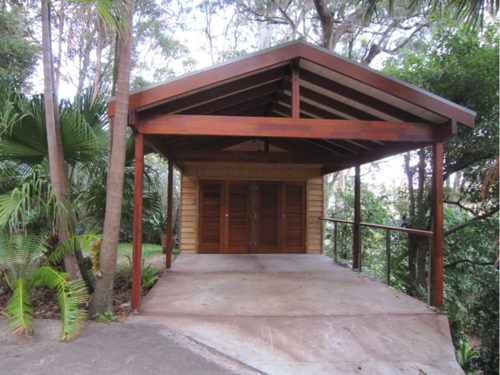 For us, it was a carport which had been sitting on the back burner for a year. Making a note as to who was building in our area of Avalon, we contacted Buster at Trentwood Building Services who had built a lovely house up the road from us. We had been very impressed by the organised flow of trades and materials over the course of the build. It was reassuring that Buster was quick to follow up our initial inquiry with a visit to discuss our design, budget and timetable. We had made a conscious decision to remain flexible with our timetable, aiming to complete the carport by the first half of the year and avoid the Christmas panic deadline which seems to start earlier and earlier each year. Using some very large laminated Merbau beams, the design required some precision carpentry. A storage area at the rear with cedar storm shutter doors and a white washed planked ceiling would complete the build. The Merbau cross beams were more expensive than traditional Pine but essential to the design and would compliment the materials and style of our house. As Buster said, “it was all about the finish”. Work started in May just when Avalon was experiencing howling cold westerly winds and record rainfall. At one stage, just when the roofing was half finished, a storm appeared out of nowhere, threatening to ruin the planked ceiling. Everyone had left for the day hours earlier. It was a great relief to see the builders return with a giant tarp to secure the site. Disaster averted! It took the two carpenters four weeks to complete, on time and on budget! The build had gone so well with very little waste from the lovely Merbau timber. Our steep driveway and the Bangalow Palms were not a problem for Buster. We had finally found a builder that we had confidence in and immediately asked him to start work on some more of those projects we had on the back burner! Do you have some of those jobs that you that are just a little too big to do yourself? Why not contact us! We’d love to help you improve your home and increase it’s value, both to you and to any future buyers. 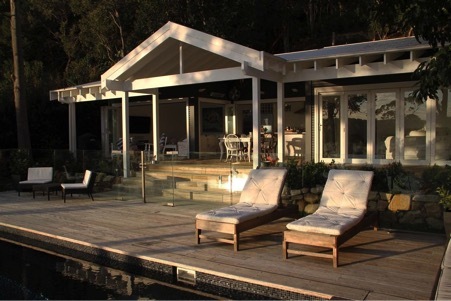 Trentwood Building Services – Your Northern Beaches Builders – are a member of the Master Builders Association of NSW. By displaying the Master Builders logo Trentwood Building Services shows that it is a respected industry company which subscribes to the code of fair business practice and is committed to the Associations code of ethics.